The incresing use of technology in our daily lifes is changing consumers behaviour, generating a thin line between the physical and virtual world, giving place to a new sector of toy innovation among analogic and digital. One of the biggest consequences of the technology influence has been the growing consumption of digital media. Kids start using technology each time before, spending most of their spare time playing with smartphones and tablets instead of playing with physical toys in the real world. Videogames and online games can be educational but they alone can’t teach and improve important developmental skills like motor and sensory skills. In this way, it is interesting to consider the combination of new technology on traditional physical toys, exploring the interaction among analogic and digital to improve the educational experience. 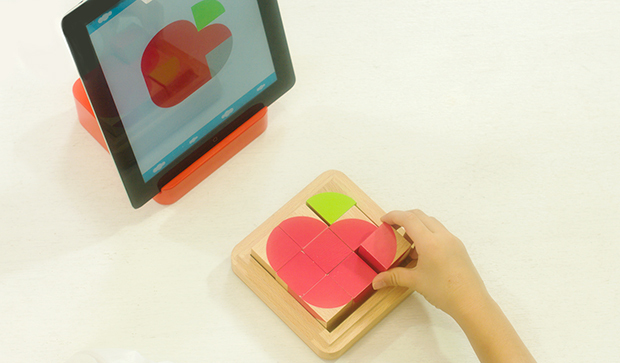 A good example of combinig physical toys with connected devices is Attocube, an educational toy that have emerged trying to fill a gap in the market as videogames have been aging up and traditional toys have been aging down. Attocube integrates timeless classic wooden blocks with technology creating a smart toy that provides fun and entertaining educational games for children ages four to eleven. The classic wooden blocks have all surfaces featured with different geometric patterns to create any image such as letters, numbers and many more. Next, these wooden blocks are transformed into smart toys just by clipping a reflector mirror attached to the top of an iOS or Android device. Using a free app, kids are allowed to play in progressively harder challenges in which they place nine wooden blocks in three-by-three patterns to match the images appearing on the screen. As the attachment recognizes the cubes the app lets kids know if they get a match right or wrong. One set of Attocube consists of nine same blocks, with each surface designed with different patterns. By arranging those 9 cubes into three-by-three square, kids can create more than 2.3 billion different images. Attocube analogic face motivates children to reach their creative potential through the freedom of play, allowing kids create their own images combining geometric patterns, increasing their thinking power. It also helps children to nurture from motor skills to spatial, tactile, dexterity, problem solving, cretivity and collaboration skills. On the other hand, the introduction of technology provides brain training puzzle games and interactive feedbacks to help kids concentrate on playing. This kind of digital-physical connection allows them to play physically as they always have, but then also creates digital experiences that can be convenient for on-the-go or can augment the physical play experience. Han, Attocube CEO, explains that the idea of Attocube borned from parents’ growing concern that their children are spending too much time with their heads buried in screens, giving as a result the merge of this two products, both of them already familiar to parents. So, with that in mind, Han began working with a group of educators and parents on the toy’s design. After founding the Attocube company, Han and his team launched their toy on Indiegogo. Looking at the emergence of the smart toy movement we can see how the toy industry is being inundated with smart toys and this has to do with the new screen time. Toy industry has been taken note and is trying to develop engaging toys that offer kids the best of both worlds, in other words, developing physical-digital augmented toys. PlayScience has been tracking smart toys, and so far the company has noticed two main paths: in one hand, physical products that interact with devices like iPads, and on the other hand, apps that can control physical objects like a teddy bear. According to Paul Levine, president and co-CEO of innovation and development company PlayScience, while the smart toy game is still new, many companies both big and small are trying to figure out a balancing act to combine the benefits of physical products and digital connection, and there is plenty of room for innovation. Innovating is a process, and it’s not easy to capture lighting in a bottle. As Levine says, we are going to see over the next few years, better incarnations where innovators really start to get the interplay of play and learning with analog and digital devices much better, so that you’ve got play augmentation and that you’re really adding something new to it.